Castles Dragons Kings and Queens! Preschoolers love fantasy play and this theme "plays" right into that! There is so much potential draw children into learning with this theme! Let's get planning for some great make believe play and learning! Provide large pieces of newsprint. Encourage the children to work together to paint a forest mural. Talk about and show pictures of what the forest looks like. Paint trees, flowers, forest critters, paths. When dry, hang outside your classroom. This is the forest before you enter the Castle: your classroom! Or, hang on the walls in your dramatic play area! The children trace their choice of crown design stencil onto large construction paper and cut it out. The children add their own decor to their crown. When dry, fit onto the child's head and staple. (I usually tape the staples to cover them. They sometimes will catch in the children's hair). Note: If you are using heavy craft materials (jewels or the like), you may want to use heavier paper than construction paper so it does not rip, such as tagboard. Roll construction paper into a cone shape and secure after the children have painted and decorated. Attach ribbons, streamers or transparent and glittery fabric from the top. Cut the tops off and cut them to only cover the top, back and sides of the head. The children decorate by gluing their choice of items on. The children decorate their stick with markers. They trace a star (or other shape) onto cardboard and cut out (you may need to precut--cardboard is difficult to cut for preschoolers). The children paint and glitter the star. Hot glue or tape the star on the end of their magic wand! VARIATION: One teacher simply had children decorate (with crayons) a colored piece of construction paper. When done, she rolled the paper up tightly and used clear tape to cover it for basic magic wands. Show the children different pictures of flag books. The children design their own flags to display around the classroom "castle"! The children design banners to hang around the classroom. Materials: cardboard egg cartons, wiggly eyes, paint, pipe cleaners (red, yellow and orange for fire). Yup, and you thought egg cartons were only for making caterpillars! Of course! Now, get creative here. Do you have blocks put away that you only bring out once in a while? I know this may seem like a lot, but the creativity it will encourage is worth it. Cereal boxes: Yes! In advance ask parents to save cereal boxes! They make AMAZING building blocks!!! Colored Wooden Blocks (you know, the ones you usually have for the math center). Provide paper and scissors for the children to make banners and flags for their castles. Provide small lunch bags for the children to open and then crumple up to represent rocks. Provide blue paper to make a mote. 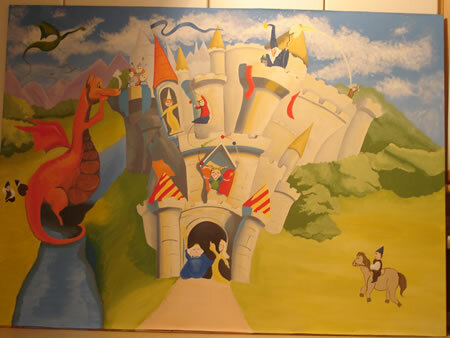 Add alligators, dragons and a play castle with knights and horses. EXTENSION: If you decide to use cereal boxes...make it an ongoing castle building event. As the children build, glue or tape the boxes together and you'll have a castle by the end of one week! Okay, not castle related, but possibly has to do with the moat! As the crocodile swims away they say "Haha! You missed me!" And scolded the knave full bore. This would be even more fun and engaging for the children if you had pictures or flannel pieces to place on a board while telling it! 5 kind kings sitting in the castle. 1 went out to find the queen. Oh, What a Hassle! 4 kind kings eating at the table. 1 went out to find his field with its own label. 3 kind kings sitting on their thrones. 1 went out to give the dragon some delicious bones. 2 kind kings putting on their crowns. 1 dropped his and it fell to the ground. He climbed on his bed and he fell fast asleep! Snack Recipe Ideas to Cook Up for Your Castles Dragons Kings and Queens Theme! Make your favorite banana muffins with the children. When cooked, place a chocolate coin on top! The children help you to measure and mix the pudding. They help to scoop pudding into a pie shell using a spoon. In medieval times, food was typically presented to please the eye as well as the tummy! Have your children "paint" onto sugar cookie dough using water with a bit of food coloring before baking them. You can also do this with milk and food coloring on bread before toasting! Notices of all kinds were delivered by horse during medieval times. Make a writing center in your dramatic play area. Glue feathers onto markers and pens. Make scrolls by rolling up paper. Provide ribbon to tie off the messages. The children use stick ponies or pretend ponies to deliver messages. Thin and thick tradition brushes for painting but also foam brushes to learn how to "sponge" paint as well! In advance, turn 2 liter plastic bottles into bowling pins by adding some clip art on the outside. Perhaps they will look like stones for the castles, or dragons! Parade Day With Some Fanfare! Have a castle dress up day! Children come in their favorite castle attire or they use the items from dramatic play to dress up. Go on a parade throughout your school using kazoos to announce the group! Set up an obstacle course in a large area or outside. Theme it! Call it the Enchanted Forest! Call the items by names that go along with it such as "Go AROUND the tree stump (which might be a trash can! ), etc. Castles, princess, queen, king, moat, knight, crocodile, etc. Add medieval puppets in the library for the children to act out some of their favorite stories. 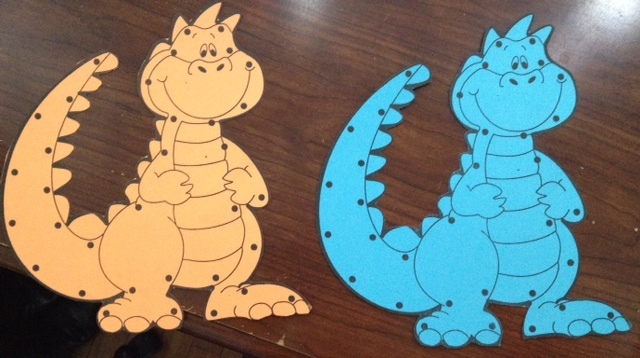 Castles Dragons Kings and Queens Theme Activities to help your Preschoolers develop math skills as well as develop those small muscles in their hands! I don't know where I got these dragons, they have been in my folder for years! I'm sure you can find a shape online that you'd like to use. Trace dragons onto sturdy cardboard and then laminate and hole punch around the outside (where the dots are on my picture). Castles Dragons Kings and Queens Theme Music and Movement Activities and Ideas to get your Preschoolers Movin' and Groovin'! Give each child a streamer to dance with. Play medieval music (like baroque) or some classical and then fast music. The Knight knees before the king; etc. Play this traditional game with the children! And he called for his, fiddlers three. Another fun one to act out! Castles Dragons Kings and Queens Theme Activities for the Senses! In advance, make many trays of ice cubes with food coloring in them! Provide the ice cubes with mittens, teaspoons and salt. The children build castles using the different ice cubes. The salt helps melt some of the ice so that two cubes will stick together! Provide water, spoons, alligators, large craft sticks and little people to your sand table. The children use the spoons to dig a moat and then add water to the moat. Use the craft sticks as a way to get across the moat. If you have a small play castle, add that to the middle! VARIATION: Instead of plain sand, mix sand and cornstarch with water to make "moonsand"! Place blue coloring into your water at the water table. Provide water wheels and other props (people, horses, leaves, alligators). Castles Dragons Kings and Queens Theme Science Activities--for your Preschool Scientists in Training! Provide magnifying glasses, different colors and shapes of glass jewels, beads, rocks and coins. Let the children inspect, compare and investigate! Provide journals for the children to draw what they find! The workers, or peasants, tended the farms and gardens for the royal family. Provide soil, seeds, paper cups and water to plant a flower garden. The children can sort and investigate the seeds one day. And use journals to chart the growth throughout your theme! Writing Activity Ideas for Your Castles Dragons Kings and Queens Theme! In advance, cut large brown grocery bags into large squares. Crinkle the pieces up and spray with a solution of water and vinegar. Let dry. Uncrinkle. They will look like old parchments! Put these in the Writing Center for this theme! Miscellaneous Activities for Your Castles Dragons Kings and Queens Theme! Hang different flags around your room. Have many non-fiction flag books available throughout your classroom. Find pictures online (or in books) print/copy and hang throughout your classroom. Is there an old castle in your town that is now something else, like a restaurant? Do some research and take a field trip!